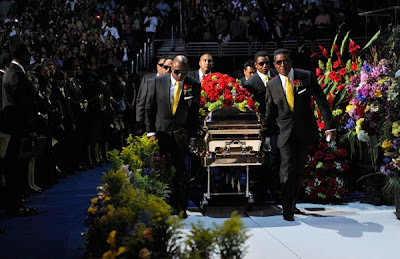 According to CNN, Michael Jackson will finally be laid to rest at the infamous Forest Lawn Cemetery in Glendale, California in the next few days. Supposedly there's going to be ANOTHER service and Gladys Knight (who really discovered the Jackson 5) is supposed to perform. Michael is going to be buried in a super private crypt at Forest Lawn that has crypt keepers at all time. His crypt is directly below a stained glass window that depicts the infamous "Last Supper" painting. Ironic since Michael had a recreation of this same painting done at his Neverland Ranch with himself as Jesus Christ.